For other uses, see Linen (disambiguation). 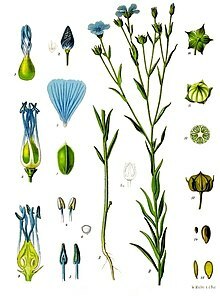 Linen /ˈlɪnən/ is a textile made from the fibers of the flax plant. Linen is laborious to manufacture, but the fiber is very strong, absorbent and dries faster than cotton. Garments made of linen are valued for their exceptional coolness and freshness in hot and humid weather. The word linen is of West Germanic origin and cognate to the Latin name for the flax plant, linum, and the earlier Greek λινόν (linón). This word history has given rise to a number of other terms in English, most notably line, from the use of a linen (flax) thread to determine a straight line. Many products are made of linen: aprons, bags, towels (swimming, bath, beach, body and wash towels), napkins, bed linens, tablecloths, runners, chair covers, and men's and women's wear. The collective term "linens" is still often used generically to describe a class of woven or knitted bed, bath, table and kitchen textiles traditionally made of flax-based linen but today made from a variety of fibers. The term "linens "refers to lightweight undergarments such as shirts, chemises, waist-shirts, lingerie (a cognate with linen), and detachable shirt collars and cuffs, all of which were historically made almost exclusively out of linen. The inner layer of fine composite cloth garments (as for example dress jackets) was traditionally made of linen, hence the word lining. Textiles in a linen weave texture, even when made of cotton, hemp, or other non-flax fibers, are also loosely referred to as "linen". Such fabrics frequently have their own specific names: for example fine cotton yarn in a linen-style weave may be called madapolam. Linen textiles appear to be some of the oldest in the world: their history goes back many thousands of years. Fragments of straw, seeds, fibers, yarns, and various types of fabrics dating to about 8000 BC have been found in Swiss lake dwellings. Dyed flax fibers found in a prehistoric cave in Georgia suggest the use of woven linen fabrics from wild flax may date back even earlier to 36,000 BP. Linen was sometimes used as a form of currency in ancient Egypt. Egyptian mummies were wrapped in linen as a symbol of light and purity, and as a display of wealth. 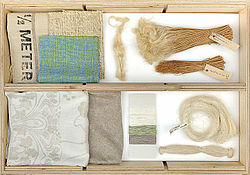 Some of these fabrics, woven from hand-spun yarns, were very fine for their day, but are coarse compared to modern linen. In 1923, the German city Bielefeld issued banknotes printed on linen. Today, linen is usually an expensive textile produced in relatively small quantities. It has a long staple (individual fiber length) relative to cotton and other natural fibers. A bag of white linen, unopened. Contains rolls of linen. Foundation deposit, Heb Sed Chapel at Lahun, Fayum, Egypt. 12th Dynasty. The Petrie Museum of Egyptian Archaeology, London. The discovery of dyed flax fibers in a cave in Georgia dated to thirty-six thousand years ago suggests that ancient people used wild flax fibers to create linen-like fabrics from an early date. In ancient Mesopotamia, flax was domesticated and linen was first produced. It was used mainly by the wealthier class of the society, including priests. The Sumerian poem of the courtship of Inanna and Dumuzi (Tammuz), translated by Samuel Noah Kramer and Diane Wolkstein and published in 1983, mentions flax and linen. It opens with briefly listing the steps of preparing linen from flax, in a form of questions and answers between Inanna and her brother Utu. In ancient Egypt, linen was used for mummification and for burial shrouds. It was also worn as clothing on a daily basis; white linen was worn because of the extreme heat. The use of linen for priestly vestments was not confined to the Israelites; Plutarch wrote that the priests of Isis also wore linen because of its purity. Linen fabric has been used for table coverings, bed coverings and clothing for centuries. The significant cost of linen derives not only from the difficulty of working with the thread, but also because the flax plant itself requires a great deal of attention. In addition flax thread is not elastic, and therefore it is difficult to weave without breaking threads. Thus linen is considerably more expensive to manufacture than cotton. There is a long history of the production of linen in Ireland. The Living Linen Project was set up in 1995 as an oral archive of the knowledge of the Irish linen industry, which was at that time still available within a nucleus of people who formerly worked in the industry in Ulster. In December 2006, the General Assembly of the United Nations proclaimed 2009 to be the International Year of Natural Fibres in order to raise people's awareness of linen and other natural fibers. When the tomb of the Pharaoh Ramses II, who died in 1213 BC, was discovered in 1881, the linen wrappings were in a state of perfect preservation after more than 3000 years. When the tomb of Tutankhamen was opened, the linen curtains were found to be intact. In the Ulster Museum, Belfast there is the mummy of 'Takabuti' the daughter of a priest of Amun, who died 2,500 years ago. The linen on this mummy is also in a perfect state of preservation. 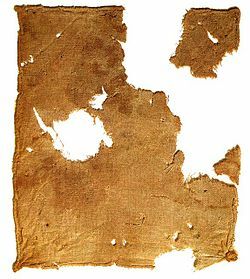 The earliest records of an established linen industry are 4,000 years old, from Egypt, The earliest written documentation of a linen industry comes from the Linear B tablets of Pylos, Greece, where linen is depicted as an ideogram and also written as "li-no" (Greek: λίνον, linon), and the female linen workers are cataloged as "li-ne-ya" (λίνεια, lineia). The Phoenicians, who, with their merchant fleet, opened up new channels of commerce to the peoples of the Mediterranean, and developed the tin mines of Cornwall, introduced flax growing and the making of linen into Ireland before the common era. It is not until the twelfth century that we can find records of a definite attempt to systematize flax production. When the Edict of Nantes was revoked, in 1685, many of the Huguenots who fled France settled in the British Isles, and amongst them was Louis Crommelin, who settled in the town of Lisburn, about ten miles from Belfast. Belfast itself is perhaps the most famous linen producing center throughout history; during the Victorian era the majority of the world's linen was produced in the city which gained it the name Linenopolis. Although the linen industry was already established in Ulster, Louis Crommelin found scope for improvement in weaving, and his efforts were so successful that he was appointed by the Government to develop the industry over a much wider range than the small confines of Lisburn and its surroundings. The direct result of his good work was the establishment, under statute, of the Board of Trustees of the Linen Manufacturers of Ireland in the year 1711. Several grades were produced from the coarsest lockram to the finest sasheen. Linen is also mentioned in the Bible in Proverbs 31, a passage describing a noble wife. Proverbs 31:22 says, "She makes coverings for her bed; she is clothed in fine linen and purple." Fine white linen is also worn by angels in the Bible (Revelation 15:6). Linen is a bast fiber. Flax fibers vary in length from about 25 to 150 mm (1 to 6 in) and average 12–16 micrometers in diameter. There are two varieties: shorter tow fibers used for coarser fabrics and longer line fibers used for finer fabrics. Flax fibers can usually be identified by their “nodes” which add to the flexibility and texture of the fabric. The cross-section of the linen fiber is made up of irregular polygonal shapes which contribute to the coarse texture of the fabric. Linen fabric feels cool to touch, a phenomenon which indicates its higher conductivity (the same principle that makes metals feel "cold"). It is smooth, making the finished fabric lint-free, and gets softer the more it is washed. However, constant creasing in the same place in sharp folds will tend to break the linen threads. This wear can show up in collars, hems, and any area that is iron creased during laundering. Linen has poor elasticity and does not spring back readily, explaining why it wrinkles so easily. Linen fabrics have a high natural luster; their natural color ranges between shades of ivory, ecru, tan, or grey. Pure white linen is created by heavy bleaching. Linen fabric typically varies somewhat in thickness and is crisp and textured, but it can in some cases feel stiff and rough, and in other cases feel soft and smooth. When properly prepared, linen fabric has the ability to absorb and lose water rapidly. Linen can absorb a fair amount of moisture without feeling unpleasantly damp to the skin, unlike cotton. Linen is a very durable, strong fabric, and one of the few that are stronger wet than dry. The fibers do not stretch, and are resistant to damage from abrasion. However, because linen fibers have a very low elasticity, the fabric eventually breaks if it is folded and ironed at the same place repeatedly over time. Mildew, perspiration, and bleach can also damage the fabric, but it is resistant to moths and carpet beetles. Linen is relatively easy to take care of, since it resists dirt and stains, has no lint or pilling tendency, and can be dry-cleaned, machine-washed or steamed. It can withstand high temperatures, and has only moderate initial shrinkage. Linen should not be dried too much by tumble drying, and it is much easier to iron when damp. Linen wrinkles very easily, and thus some more formal garments require ironing often, in order to maintain perfect smoothness. Nevertheless, the tendency to wrinkle is often considered part of linen's particular "charm", and many modern linen garments are designed to be air-dried on a good clothes hanger and worn without the necessity of ironing. A characteristic often associated with linen yarn is the presence of slubs, or small, soft, irregular lumps, which occur randomly along its length. In the past, slubs were traditionally considered to be defects, and were associated with low quality linen. However, in the case of many present-day linen fabrics, particularly in the decorative furnishing industry, slubs are considered as part of the aesthetic appeal of an expensive natural product. In addition, slubs do not compromise the integrity of the fabric, and therefore they are not viewed as a defect. However, the very finest linen has very consistent diameter threads, with no slubs at all. The standard measure of bulk linen yarn is the "lea", which is the number of yards in a pound of linen divided by 300. For example, a yarn having a size of 1 lea will give 300 yards per pound. The fine yarns used in handkerchiefs, etc. might be 40 lea, and give 40x300 = 12,000 yards per pound. This is a specific length therefore an indirect measurement of the fineness of the linen, i.e., the number of length units per unit mass. The symbol is NeL. (3) The metric unit, Nm, is more commonly used in continental Europe. This is the number of 1,000 m lengths per kilogram. In China, the English Cotton system unit, NeC, is common. This is the number of 840 yard lengths in a pound. Mechanical baling of flax in Belgium. On the left side, cut flax is waiting to be baled. The quality of the finished linen product is often dependent upon growing conditions and harvesting techniques. To generate the longest possible fibers, flax is either hand-harvested by pulling up the entire plant or stalks are cut very close to the root. After harvesting, the plants are dried, and the seeds are removed through a mechanized process called “rippling” (threshing) and winnowing. The fibers must then be loosened from the stalk. This is achieved through retting. This is a process which uses bacteria to decompose the pectin that binds the fibers together. Natural retting methods take place in tanks and pools, or directly in the fields. There are also chemical retting methods; these are faster, but are typically more harmful to the environment and to the fibers themselves. After retting, the stalks are ready for scutching, which takes place between August and December. Scutching removes the woody portion of the stalks by crushing them between two metal rollers, so that the parts of the stalk can be separated. The fibers are removed and the other parts such as linseed, shive, and tow are set aside for other uses. Next the fibers are heckled: the short fibers are separated with heckling combs by 'combing' them away, to leave behind only the long, soft flax fibers. After the fibers have been separated and processed, they are typically spun into yarns and woven or knit into linen textiles. These textiles can then be bleached, dyed, printed on, or finished with a number of treatments or coatings. An alternate production method is known as “cottonizing” which is quicker and requires less equipment. The flax stalks are processed using traditional cotton machinery; however, the finished fibers often lose the characteristic linen look. Flax is grown in many parts of the world, but top quality flax is primarily grown in Western European countries and Ukraine. In recent years bulk linen production has moved to Eastern Europe and China, but high quality fabrics are still confined to niche producers in Ireland, Italy and Belgium, and also in countries including Poland, Austria, France, Germany, Sweden, Denmark, Belarus, Lithuania, Latvia, the Netherlands, Spain, Switzerland, Britain and Kochi in India. High quality linen fabrics are now produced in the United States for the upholstery market and in Belgium. Russia is currently the major flax cultivating nation. Over the past 30 years the end use for linen has changed dramatically. Approximately 70% of linen production in the 1990s was for apparel textiles, whereas in the 1970s only about 5% was used for fashion fabrics. Linen uses range across bed and bath fabrics (tablecloths, bath towels, dish towels, bed sheets); home and commercial furnishing items (wallpaper/wall coverings, upholstery, window treatments); apparel items (suits, dresses, skirts, shirts); and industrial products (luggage, canvases, sewing thread). It was once the preferred yarn for handsewing the uppers of moccasin-style shoes (loafers), but has been replaced by synthetics. 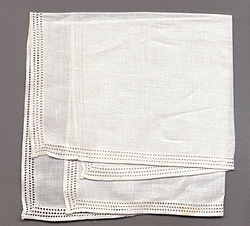 A linen handkerchief, pressed and folded to display the corners, was a standard decoration of a well-dressed man's suit during most of the first part of the 20th century. Linen fabric is one of the preferred traditional supports for oil painting. In the United States cotton is popularly used instead, as linen is many times more expensive there, restricting its use to professional painters. In Europe, however, linen is usually the only fabric support available in art shops; in the UK both are freely available with cotton being cheaper. Linen is preferred to cotton for its strength, durability and archival integrity. Linen is also used extensively by artisan bakers. Known as a couche, the flax cloth is used to hold the dough into shape while in the final rise, just before baking. The couche is heavily dusted with flour which is rubbed into the pores of the fabric. Then the shaped dough is placed on the couche. The floured couche makes a "non stick" surface to hold the dough. Then ridges are formed in the couche to keep the dough from spreading. In the past, linen was also used for books (the only surviving example of which is the Liber Linteus). Due to its strength, in the Middle Ages linen was used for shields, gambesons, and bowstrings; in classical antiquity it was used to make a type of body armour, referred to as a linothorax. Because of its strength when wet, Irish linen is a very popular wrap of pool/billiard cues, due to its absorption of sweat from hands. Paper made of linen can be very strong and crisp, which is why the United States and many other countries print their currency on paper made from 25% linen and 75% cotton. ^ lining. Dictionary.com. Online Etymology Dictionary. Douglas Harper, Historian. "Archived copy". Archived from the original on 2014-10-06. Retrieved 2014-10-04. CS1 maint: Archived copy as title (link) (accessed: October 3, 2014). ^ a b Balter, M (2009). "Clothes Make the (Hu) Man". Science. 325 (5946): 1329. doi:10.1126/science.325_1329a. PMID 19745126. ^ a b Kvavadze, E; Bar-Yosef, O; Belfer-Cohen, A; Boaretto, E; Jakeli, N; Matskevich, Z; Meshveliani, T (2009). "30,000-Year-Old Wild Flax Fibers". Science. 325 (5946): 1359. doi:10.1126/science.1175404. PMID 19745144. ^ Harris, Thaddeus Mason (1824). The natural history of the Bible; or, A description of all the quadrupeds, birds, fishes [&c.] mentioned in the Sacred scriptures. p. 135. Archived from the original on 27 June 2014. Retrieved 23 October 2012. ^ Walter Grasser / Albert Pick (1972). Das Bielefelder Stoffgeld 1917-1923. Berlin, Germany: Erich Pröh. ^ Robkin, A. L. H. (1 January 1979). "The Agricultural Year, the Commodity SA and the Linen Industry of Mycenaean Pylos". American Journal of Archaeology. 83 (4): 469–474. doi:10.2307/504148. JSTOR 504148. ^ The Jewish Primer, by Shmuel Himelstein. New York, NY: Facts On File, 1990. ^ "Flax Fiber Offers Cotton Cool Comfort". Agricultural Research. November 2005. Wikimedia Commons has media related to Linen (flax). Wikisource has the text of the 1921 Collier's Encyclopedia article Linen. Look up linen in Wiktionary, the free dictionary.